The researchers’ isotopic analysis of both megalithic graves and caves suggests a similar C3 plant-based human diet, mostly consisting of wheat and barley, as well as a substantial amount of protein from cattle and sheep. 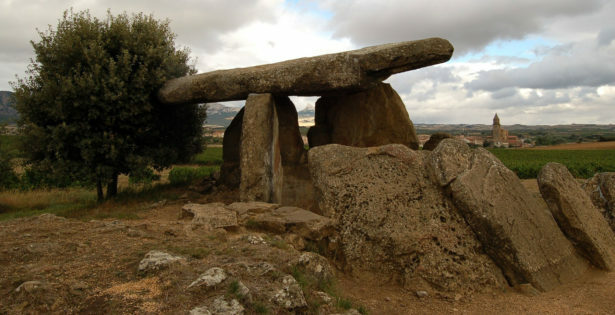 An isotopic analysis of megalithic graves and caves in Spain may suggest the existence of a degree of differentiation in the lifeways of people buried in these different funerary sites, according to a study published on September 27, 2017 in the open-access journal PLOS One by Teresa Fernández-Crespo and Rick Schulting from the University of the Basque Country, Spain and the University of Oxford, UK. The researchers’ isotopic analysis of both megalithic graves and caves suggests a similar C3 plant-based human diet, mostly consisting of wheat and barley, as well as a substantial amount of protein from cattle and sheep. However, the study surprisingly reveals significant carbon isotope differences between people interred in both funerary site-types. These differences seem to be correlated with elevation, temperature, and precipitation, implying that land use was partitioned on a surprisingly local scale. The authors propose two possible explanations. The first is that this division of land could indicate different socioeconomic classes within the same community, with the lower classes being interred in caves with restricted access to agricultural resources, while the individuals of higher status in the community were buried in monumental graves whose construction would involve a considerable investment of labor. Alternatively, they also consider the possibility that this partitioning of the landscape may involve different populations performing different funerary practices and following distinct subsistence economies in some respect.